An advanced trio of highly acclaimed antioxidant nutrients, Lycopene, vitamin E and Selenium which help to maintain a healthy prostate. The power of the tomato in a vegetarian and vegan gelatin free capsule. To leave a review for this product, please log in to your account. If you do not have an account, you will need to create one by clicking the 'Register' button in the 'Your account' box to the right of the page. So far, no one has left a review for this product. We've tried to ensure that paying for your order is as convenient for you as possible, so you can use your Visa, MasterCard, Maestro, Switch or Solo card. We also accept cheques and postal orders, but would not advise sending cash through the post. 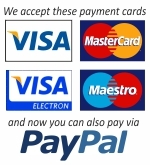 We've also recently added PayPal as a payment option for you. Orders are despatched as soon as possible after we receive them. This generally means that orders received before noon Monday to Friday will be despatched the same day, while orders received after that time will be despatched on the next working day. All UK orders are sent by second class post, unless otherwise requested (there may be a charge for services other than second class). Postage is free on all UK deliveries over £15 in value. Delivery by second class post takes, on average, three or four days. All non-UK orders are sent by Royal Mail Airmail. Postage is charged according to the weight of the parcel and the destination country. Postage charges will be automatically calculated during the checkout process. Larger orders with greater weight (over 2kg) may be split into several parcels, to reduce the cost of postage.